Posted this recipe primarily for the great videos of the step-by-step method on how to make the spelt dough for the simosas. The recipe is for vegetable simosa, but stuff ’em with whatever you like! Set aside for ten mins then go back to it with damp hands and knead. Repeat this process until dough is smooth in appearance. 1. In a frying pan with a small amount of oil add sliced onions and sweat off (Sweating in cooking is the gentle heating of vegetables in a little oil or butter, with frequent stirring and turning to ensure that any emitted liquid will evaporate. Sweating usually results in tender, sometimes translucent, pieces. 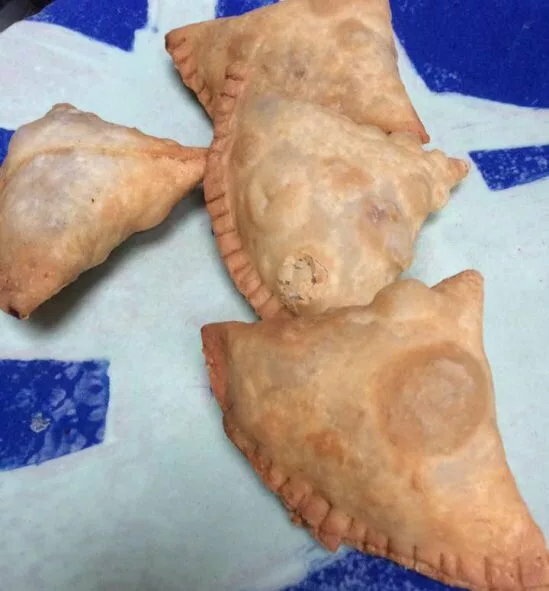 You don’t want your mixture inside to be wet otherwise the samosas will be soggy and can break open when cooked). Add chopped peppers and zucchini, kale. Sweat off all the veg until most, if not all, the water has evaporated. Then add chopped mushrooms and cooked chick peas right at end. 2. Leave to cool as you don’t want to add hot filling to the dough! 4. Using the dough make 16 med size balls. 6. Half cook on one side, remove and cut into half so you have two semi circles. 7. With curved edge at top bring the two corners together so it forms an upside down triangle and there’s no gap at the point. Using the glue paste the centre overlap to seal. 8. Put the cooked filling in but not too much then glue the top and seal the edge with a fork. 9. Fry in oil from Dr. Sebi’s nutritional guide. This entry was posted in Food & receipes and tagged alkaline foods, dr sebi's nutritional guide, eat to live, organice foods, recipes, simosas. Bookmark the permalink.